Ultimate Windows Tweaker is a portable Windows Tweak utility ideal to tweak and optimize Windows Vista system. It is a small utility of size 370kb loaded with over 130 tweaks. It gives access to loads of hidden Windows Vista features that can be tweaked with simple mouse clicks. This can results in faster and more stable Vista on your computer. It has easy to use interface with tweaks listed under different categories like UAC, performance, security, internet explorer andÂ many more. It can detect the version of Internet Explorer among IE 7 or IE 8 and offer you tweaks accordingly. 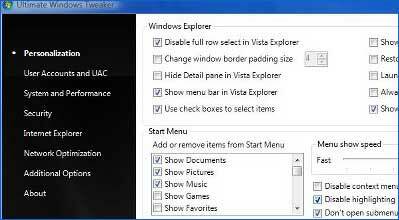 Ultimate Windows TweakerÂ [link] works fine on Windows Vista (both 32bit and 64 Bit). Please note, Windows 95, 98, ME, NT and XP are not supported. Very handy utility to tweak those hidden and very useful features in Windows Vista. Just download and start tweaking (no install)! P.S. It is recommended to create restore point using System Restore before you make any changes using this Vista tweaker.